Annwyn is available for Skype mentoring and/or Sound-Healing sessions for children and their families. Intuitive insights are often received during sessions, as well as Sound Harmonics to balance, heal, revive the Etheric and Physical body as needed in each case. $95 for 60-90 minutes. One to one sessions are available in Auckland, New Zealand. Who are the Golden Age Children? The ‘Golden Age Children’ are a collective consciousness known under many different names such as ‘The New Children, The Children of Now’ etc. I respectfully call this collective consciousness the Golden Age Children because they play a crucial part in the incoming Golden Age on our planet Earth. (Previous Golden Ages were Lemuria, Atlantis and Greece). There are many facets to this collective consciousness and over the past decades different streams of souls have incarnated at specific times in order to bring different vibrational frequencies and gifts to Earth. You may have heard of Indigo, Crystal, Rainbow, Violet Crystal or Diamond Children; all have incarnated during certain years, when their vibratory frequency could be anchored on Earth, bringing many different qualities and skills needed at that time. Their level of soul evolution is beyond the understanding or imagination of mainstream humanity because they are the way-showers of the Fifth Dimensional planet that Earth is becoming. The fact that they are incarnating in large numbers now is very exciting as it shows humanity is getting closer and closer to becoming a civilization of Oneness. These souls are experts in Oneness, which is the exact opposite of separation that we currently experience on Earth. Oneness is like a global or universal mind, where only peace, unconditional love and joy can exist. It is where All That Is, is experienced by all who dwell there. Think of a flock of birds or a school of fish who can effortlessly operate as One, as they quickly turn, dive in a nano second. Within Oneness there is still uniqueness, but it is experienced as being delineated rather than separated. It is much more subtle. Why are they incarnating onto Earth at this time? These incredible souls are incarnating now because of a larger cosmic picture that most of humanity are unaware of. Earth belongs to the Milky Way Galaxy which is host to twelve dimensions. The entire galaxy is undergoing evolutionary change and Earth is part of this. You may have heard of the very rare planetary alignment last December known as 12.12.12? It was know as the end of the Mayan calendar to some, and it was; but there were also many ,many cycles of planetary and galactic cycles ending, and new cycles beginning. Earth ended the Piscean era and began the Aquarian era; the time for planet Earth to ascend from a third dimensional planet to a fourth and fifth dimensional planet. Now, for humanity ( and the minerals, plants and animals), to live comfortably on Earth, we must be aligned with her increased energy field. This is known as the Electro Magnetic Field (EMF) and all living things have an EMF which must resonate, or vibrate at the same rate as the host planet. Earth has raised her EMF vibration significantly (scientists know this!) and therefore so must humanity. This is why the Golden Age Children are here. They have come to show us how to raise our vibrations, our very consciousness. You see, humanity has been preoccupied with matters of the mind, which suited a third and fourth dimensional planet, but in fifth dimension, it is the heart that must guide us. This why you are hearing so much about living through the heart, and mastering the mind. Fifth dimensional vibration is that of unconditional love and joy-how many people do you know who operate in love and joy? Apart from children, that is! Sadly, most of humanity is under the illusion and grip of the mind, which knows separation and duality, not Oneness. We can only create a New Earth with Heart Energy of unconditional love and joy. Our GAC only know love and joy, and nothing less than that. They were born embodying these qualities and it is essential that these qualities are nurtured so they can inspire humanity to do the same. They are here as ambassadors of Love, Joy, Peace and Oneness. They are our way-showers, our teachers. To give a broad picture of the different streams that have arrived at specific times (although there are always advance parties and van guards!) here are some examples. 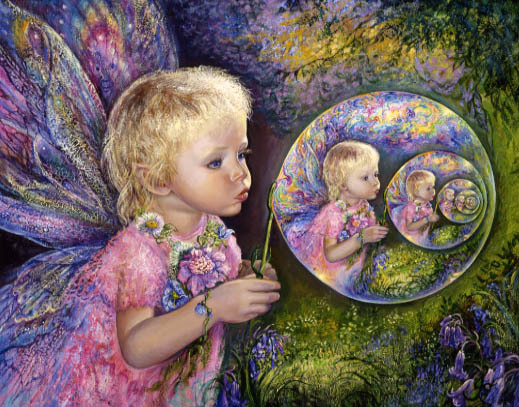 Crystal children who came to heal emotional wounds by bringing empathetic qualities of healing through love. Rainbow children who build on the qualities of Indigo and Crystal children and also have gifts of Creative Manifestation. Great influx of rainbow children from 2010. Violet Crystal Children who will heal/repair Earths Grids to accelerate healing for Humanity. Diamond Children. The new world teachers known as Avatars will begin to incarnate. How can I tell if my child is a Golden Age Child? Very high levels of physical energy and stamina and are often labelled ADHD. May not express/receive dense emotions (such as anger, fear,which are not experienced in advanced realms) and are often labelled autistic. May not communicate verbally (but are communicating telepathically or on an energy level) -again seen as autistic. Very sensitive to synthetic foods, fabrics, and toxins in environment- household cleaning products etc. Often disturbed by nightmares and also at times require very little sleep. Adore animals and nature- they are attuned to them and appreciate their high vibrations of unconditional love. What are the challenges for them? They may feel isolated from being misunderstood and being marginalised because of their uniqueness. They are arriving in a world where only a minority of people explore the Spiritual pathway and yet they have come from highly advanced Spiritual Realms which only know Peace, Love and Oneness. Earth seems very loud, harsh and unloving to them. Many experience difficulty with parenting and educational practices. They are used to being treated as equals and are also used to having experiences manifest instantly for them- many appear to be demanding because they are not used to time delay. They are able to access the Universal Mind and have unlimited knowledge and sound wisdom- but this may be ignored, ridiculed, or suppressed if the wise old owl is only three years old! Many of these children function from the right side of the brain and therefore struggle with a left-sided school system. Not only that, they are at a loss to understand studying history when they ‘live in the moment!’ They become a mystery for teachers who recognise intelligence but don’t see the achievement they expect to see- many are labelled dyslexic, ADHD, autistic and so on. Often these children have very high energy levels and need lots of physical activity to release this excess- trampolining is excellent for this. Strict, conventional classroom routines can be a nightmare for them. When the children are nurtured in a way that suits them they will recall the gifts and abilities they brought with them. But these are different from how the current educational system views ‘gifted children’ who are children that exceed at the top level of third dimensional performance. The GAC will bring abilities that we find hard to imagine and will perhaps at times find difficult to recognise. They will be expressed in a myriad of ways that goes beyond current measures of achievement. Crystal children are highly empathetic and may soak up the emotional dross of all those around them- which makes them feel emotionally burdened or even physically unwell. Many are telepathic and can sense others thoughts, which can also burden and confuse them…think about the quality of the thoughts many people have going on in their untrained minds! These are just a few aspects that these sensitive, highly intelligent children have to cope with. Of course, there are also Golden Age Children who seem to sail through life with absolute ease and grace too! What are the challenges for parents and educators? Equally, there are challenges for parents and educators and you will have realised some of them by what you have read so far! For adults who can open their hearts and minds wide enough to accommodate the uniqueness of these children, they will be blessed with inspiring, delightful children. Sadly, there will those who are unable to do this and life may well become an unhappy battle field for all concerned. The GAC are programmed for creating a New Earth and are not influenced by generational and cultural conditioning as their fore-bearers were. They will do what they came to Earth to do, – and if it means leaving their family, they will do this, while still holding you deeply in their unconditional love. To parent and educate some of these children will require a quantum shift in beliefs about parenting and teaching roles. While the GAC still need to experience childhood, they don’t need to experience control. They need to be accepted and loved unconditionally, which may be a challenge at times. Often, current interaction with children is to engage cooperation through subtle bribery- or if that fails- absolute authority- neither will work with these enlightened souls! The key for parents and educators is to raise your own awareness and consciousness so that you are more able to meet your children where they are at. The children will reflect your thoughts, emotions, behaviours back to you like a mirror that you won’t appreciate at times! Especially when you are unaware of your own thoughts, emotions and behaviours! Where can I find more information, support and understanding? I agree with Lisha. I am 57 years old, and a golden female. Dearest Lisha, yes you are absolutely correct; we cannot put the limitations of age/time around this and the above time periods are just to give an idea of the continuous streams of frequencies coming to Earth. From the perspective of the human mind this can be helpful, but is not intended as definitive time frames. As said above “To give a broad picture of the different streams that have arrived at specific times (although there are always advance parties and van guards! )” The bigger picture around this topic is that actually we are ALL Golden Age Children because we incarnated at a time when the return of the Golden Age is eminent. Thank you for being on the planet at this exciting time! Annwyn. I agree with Lisha. I am 57 years old, and a golden person. Hi Rosa, Ruby, and Lisha, Many thanks for reading my page and please my reply above. Blessings on you ALL, Annwyn. Most definately am looking forward to having a future Healing Session with you Annwyn & would like to get in touch with you via email re this if that be possible. Thankyou. Dearest Coula, Thanks for your comments and connection. I have just spent a few days with a a delightful woman of 86 years who is definitely carrying the frequencies of the Golden Age! In the eyes of our God-Source/Creator, we are all children in Earth-School! It would be an honour to work with you in a skype session and I shall email you. Blessings to your beautiful heart, Annwyn. I am 42 & a golden child or some have called me as an empath. Is that possible? I found your article enlightening thank you for your insight. Many thanks for your feedback. An empath is someone who deeply feels others’ emotional state and this is very common in the New Children /Golden Age Children who have highly-developed abilities to feel the emotional. mental and physical energy fields of other people, animals, environment. Although there have been waves of children arriving in different years according to their the gifts they have, and according to planetary alignments during their births, there is no limitation around age. it is just that certain potentials are realised during particular times on Earth, and births (and deaths) are carefully planned to take full advantage of the wider cosmic picture. Also, it is important the golden child awakens to their Service they have come to do. By keeping our vibrations as high as possible, our consciousness naturally expands, giving the insights and memories of what we came to Earth to do. My daughter was labeled a golden child from a stranger that said she seen a very strong aura around her. The strongest she had ever seen. Tiffany was born in 2009 and her name means manifestation of god. I myself have never been drawn to crystals. Tiffany’s passion for crystals and animals have grown so intense we have always wondered where this has come from. Tiffany was diagnosed with dyslexia early last year because she struggled at school though her knowledge for crystal is outstanding. She can remember the names for all your owned crystals they can’t remember simple sight words. Where can I receive guidance to help Tiff in her journey? I loved hearing from you, thank you! You are among those beautiful souls who are now incarnating to bring the truth, peace and prosperity back to our planet, for everybody to enjoy. I agree, the Golden Age is already forming. Many Light Workers are holding this vision with you Noah,and I love it that you are communing with the Universe. Thank you for holding your vision and your Crystalline Energies. Blessings to you beautiful Heart, Annwyn. Thanks for sharing this information. I’m 13 years old and I am a diamond golden child. You mentioned the incoming golden age. I believe that it has already started with the first incarnations of Indigo Children, Starseeds and other light workers, and has been getting more obvious recently. I have also seen that the universe itself is sending the message of the new golden age. I believe that this golden age will last much longer than one would expect, as the influx of high vibrational energies that Earth and this dimension is receiving is enormous. The new golden age will also bring many miracles for only the better. I would also like to say that your descriptions above resonated with me immensely: almost everything was accurate. My mission in life is exactly what you stated it to be: teach and spread unconditional love and joy. I have always felt this to be my life long mission – no doubt. Your words have definitely helped me feel more understood here on Earth, along with reminding me that I am not truly alone and will never be.